Citation: Strychnos colubrina L., Sp. Pl. 189. 1753; Hook. f., Fl. Brit. India 4: 87. 1883; Gamble, Fl. Pres. Madras 868(610). 1923; Sasidh. & Sivar., Fl. Pl. Thrissur For. 297. 1996; Sasidh., Fl. Periyar Tiger Reserve 255. 1998; Sasidh., Fl. Parambikulam WLS 199. 2002; Mohanan & Sivad., Fl. Agasthyamala 457. 2002; Ratheesh Narayanan, Fl. Stud. Wayanad Dist. 541. 2009. Strychnos wallichiana Steud. ex A. DC. in DC., Prodr. 9: 13. 1845; Mohanan, Fl. Quilon Dist. 262. 1984; Ramach. & V.J. Nair, Fl. Cannanore Dist. 289. 1988; M. Mohanan & Henry, Fl. Thiruvanthapuram 303. 1994; Vajr., Fl. Palghat Dist. 296. 1990; Pradeep, Fl. Vellarimala 100. 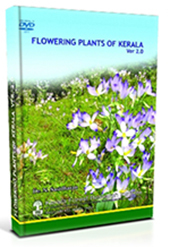 2000; Anil Kumar et al., Fl. Pathanamthitta 325. 2005. Strychnos rheedei Clarke in Hook. f., Fl. Brit. India 4: 87. 1883. Strychnos cinnamomifolia Thw., Enum. Pl. Zeyl. 201. 1860, var. wightii Hill, Bull. Misc. Inform. Kew 1917: 194. 1917; Gamble, Fl. Pres. Madras 869(610). 1923; Manilal & Sivar., Fl. Calicut 172. 1982. Description: Tendrillate climbers. Leaves simple, opposite, 5-8 x 3-5 cm, broadly elliptic, abruptly acuminate, shining, green or black when dry; 3-ribbed, nervules prominent, irregular. Cymes axillary and terminal, peduncled, 5-6 cm across. Flowers many; pedicels 2 mm long. Calyx 1.5 mm long, lobes ovate, obtuse, ciliate. Corolla greenish yellow, tube 10 mm long, hairy inside, lobes 4 x 2 mm, oblong, obtuse. Anthers sessile. Ovary hirsute; ovules manu; style 12 mm long, hirsute, stigmas bilobed, globose. 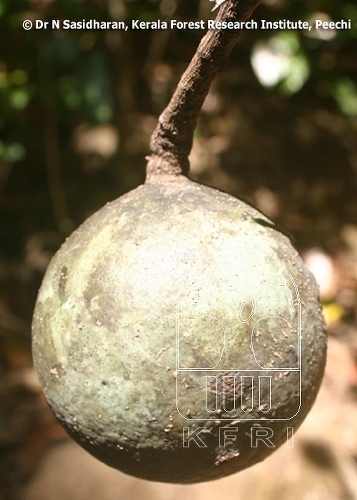 Berry globose, 6-8 cm across, glabrous, greenish; seeds 2.5 cm long, ovoid, flattened.